In order to provide you with the right HRV system for your requirements, we offer the HRV-Scanner in various versions. All versions are compatible and use the same data pool. An upgrade is possible at any time. We offer our systems as complete sets (software + hardware + accessories) or “only software”. Compact or Professional differs in the number of manageable clients. Study includes a module to support scientific studies. “lite“, “standard” or “plus” differ in available tests, biofeedback functions and evaluation options. Step 1: Complete set or only software? If you don’t have any compatible ECG and want to perform HRV measurements or biofeedback then you need a complete set. Do you already have a HRV-Scanner or a suitable hardware for HRV measurements or want a second license to be able to evaluate and review data? ⇒ Then an “only software” variant is ideal for you. Step 2: What kind of measurements would you like to run? Are you a beginner and would like to start with the basic HRV measurements (short-term HRV and Deep Breathing test) and HRV biofeedback? 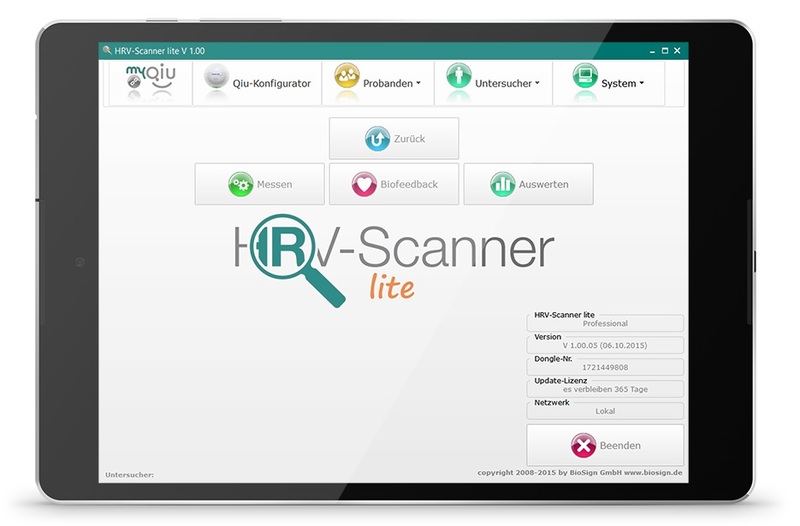 ⇒ Then the HRV scanner lite is the ideal offer for you. If you want more advanced tests, such as the 24-hour long-term measurements in addition to the basic HRV measurements, then we recommend the HRV-Scanner standard. Do you want to measure the breathing reliably and also perform the Valsalva maneuver? ⇒ In this case, you should choose the HRV scanner plus variant. Step 3: How many clients do you want to manage? HRV measurements and HRV biofeedback are a focus of your daily work and you measure many clients? ⇒In this case you should go for the Professional version. Unlimited client storage space is at your disposal. Do you also want to carry out HRV studies? ⇒With the additional study module in the Study version, the HRV-Scanner supports you in your scientific work. When you purchase an HRV-Scanner, you receive an instruction and support from us. If you have any questions or problems, please do not hesitate to contact us. * What does storage space mean? For each client, an unlimited number of measurements and biofeedback sessions can be carried out.In the Compact version the data of 5 clients can be managed parallelly. If you want to add a sixth client, either clear space in the database (delete a client and his or her measurements) or upgrade to a higher version (upgrades are possible at any time without reinstallation, please contact us). The HRV-Scanner is constantly improved and further developed. The automatic online update system allows you to participate immediately when a new update is available. When purchasing an HRV-Scanner, 365 days of updates are included. Wrist electrodes allow an easy ECG recording without the need that clients have to undress. Alternatively, adhesive electrodes can also be used.